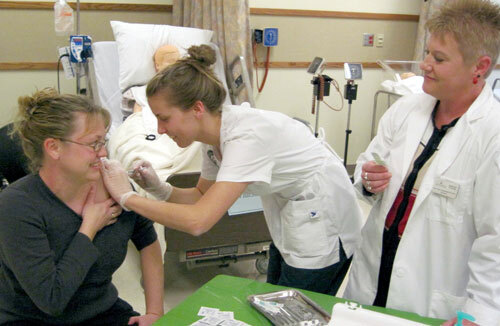 Junior nursing student Megan Durham gives HU employee Grace McBrayer her flu shot while Professor Diana Shenefield looks on. Huntington University’s Department of Nursing, in collaboration with the Huntington County Department of Health, offered flu shots on October 22. After learning fundamental skills this semester, the first class of nursing students from participated in giving seasonal flu vaccines at the flu shot clinic. The clinic took place in the university’s Science Hall. Last night (Thursday), Sandy and I had supper with Andy and Merri Sikora, both Huntington University graduates who live in Berea, Ohio. Tom Blaylock was also there. Andy is currently the Lead Teaching Pastor for the 707 Sunday night young adult ministry at Cuyahoga Valley Church in Broadview Heights, Ohio. Andy and Merri are going to plant a United Brethren church in Berea starting next fall. We had a great supper and conversation. Rick Duncan, who pastors Cuyahoga Valley Church. Guy Stevens, who heads a church planting organization called NEO360, based in Cleveland, Ohio. Matt Jones, an intern with NEO360. We had a great meeting as they shared their vision for impacting northeast Ohio with planting churches which not only see lost people come to Christ, but also impact their communities with their presence in every area. Exciting stuff. They want to partner with us to see a UB church planted. We all want to work across denominational lines to accomplish the mission of impacting the kingdom of God. 30 Oct The Well: A New (But Old) UB Church in Huntington, Ind. 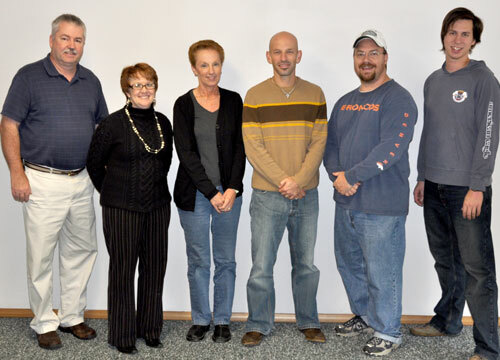 L-r: Bishop Phil Whipple, Cathy Reich (administrative assistant to the bishop and a member of The Well), Kim Chapman (office manager), Josh Kesler (senior pastor), Kevin Whitacre (Pastor of Youth and Pastoral Visitation), and Drew Wutke (Pastor of Worship and Creative Arts). The office of The Well. Good Shepherd UB church of Huntington, Ind., has been undergoing major, major changes. Last spring, they decided to sell their large property–a former monastery on a large tract of land–and meet in temporary facilities. August 16 was their final service in the building they had occupied for nearly 30 years. They met for a few weeks in temporary facilities. Then, on September 13, they began meeting at Flint Springs Elementary School in Huntington. They plan to remain there for at least a year. On that day, The Well was officially established. That’s the name of the church now. Good Shepherd UB church has effectively closed, and The Well has begun. 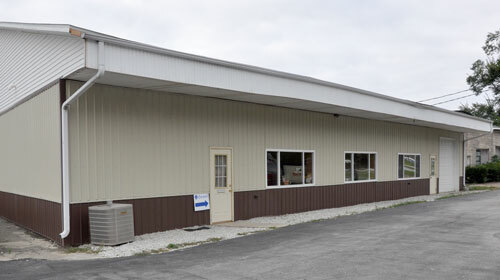 The office staff moved into quarters on Old US 24 on the east side of Huntington. A large open area can be used for youth meetings, music practice, and other things (since they have access to the school only on Sunday). They have a buyer for the property, but the sale isn’t finalized. Nothing’s final until it’s final. Josh Kesler has been the senior pastor since July 2008. This congregation started in the 1950s under the name Grayston Avenue UB church, which reflected its location. 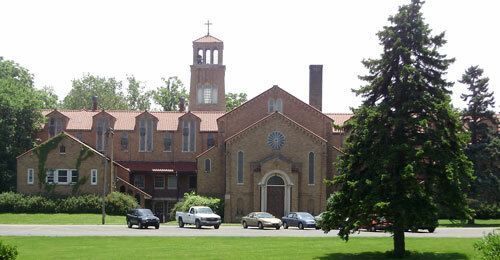 When they bought the monastery, they changed the name to Good Shepherd. Bishop Phil and Sandy Whipple left today on a 12-day trip that will take them to churches in Ohio, Pennsylvania, and New York. The trip includes a consultation weekend at Bethel Temple of Praise in Yonkers, N.Y. It culminates with the Mid-Atlantic Pastoral Resource Day November 8-9 at Rhodes Grove Camp (Chambersburg, Pa.). Bishop Whipple will speak during the opening service on Sunday night, November 8, and lead devotions the next day. During a chapel message to Huntington University students in early September, I presented five practical tips for modeling unity as believers within a diverse community. Here is the first one. 1. Understand and appreciate each others’ diverse backgrounds, cultures, and experiences. Sometimes when something is different than our own culture and experience, we tend to dismiss it or think it’s funny or unusual. When I worked at another institution more than 20 years ago, we brought inner city kids from New York City to a very rural community to spend time camping and hiking in the woods. It was an eye-opening experience. These students were used to being on the street and hearing the noise of sirens, jackhammers, cars, and the sound of busy city life. But when taken into the country, they were scared to death. Scared of the silence at night. Scared that a bear or other wild animal might come out to attack them. Scared that someone might come into their tent at night to harm them. Just as I would be scared in their inner city environment, they were scared in my environment in a rural, wooded community. You will encounter people who don’t do things the same way you do them; people who have different life experiences and cultural traditions and norms. I encourage you to listen, observe, understand, and appreciate each other’s backgrounds, cultures, and experiences and work to understand their hearts and concerns. The Women’s Ministry Leadership Team has a new website. It has information about the 2010 UB Women’s Conference, to be held in Lancaster, Pa, next September. The annual Mid-Atlantic Pastoral Resource Day will be held November 8-9 at Rhodes Grove Camp and Conference Center near Chambersburg, Pa. The event begins 7 pm Sunday night, November 8, with message from Bishop Phil Whipple. On Monday morning, Bishop Whipple will give devotions. The rest of the day, 9 am – 4 pm, will focus on the topic “Addiction in the Pews: Understanding the secret struggles of addiction and how to bring ‘hope to the hopeless.” The presenter will be Carol Reinertson, formerly director of the Addiction Studies Program in the Campolo College of Graduate and Professional Studies of Eastern University. A .5 CEU credit is available. The cost is $40 per person. Lodging is also available at Rhodes Grove Camp. The Mount Zion United African Church (Philadelphia, Pa.) celebrated 15 years of service to the city’s African community on October 25. This congregation, which includes a number of immigrants from Sierra Leone, is pastored by Joe Abu. 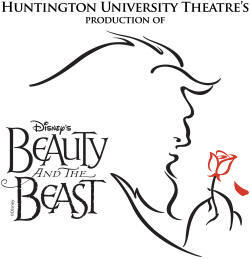 The Huntington University Department of Theatre Arts is bringing Disney’s “Beauty and the Beast” to the campus. Location: Zurcher Auditorium in the university’s Merillat Centre for the Arts. $10 for students and senior citizens. $6 for those 13 and younger. To purchase tickets, contact the Merillat Centre for the Arts Box Office at (260) 359-4261. For more information…. I grew up in Livingston, New Jersey, a community populated by a majority of people of the Jewish faith. Being a Gentile obviously made me a minority in that community. The food I ate was often different than that of my friends. My traditions were different. I didn’t celebrate the Jewish holidays such as Passover and Chanukah, but celebrated Christmas and Easter. My lifestyle was different. My family was of modest means rather than of a wealthy lifestyle. My experiences were different. I didn’t go through a bar mitzvah ceremony, nor did I attend religious services on Friday evenings or Saturday. Loneliness, not experiencing the same things they were experiencing or being involved in their religion. Conversations often revolved around Jewish traditions and events, things I wasn’t part of. I often felt like a second-class citizen because I was not from a wealthy home like they were, nor did my father have a prestigious job like many of their parents. Because many of my friends were not Christian, my faith and my Gentile culture were not reinforced. I imagine that some Huntington University students who are from a racial, ethnic, or cultural background different from the majority white student population experience some of the same things. They may sense that they are viewed differently, treated differently, that their cultural background and traditions aren’t understood by other students. We want to do better, and to understand better. That’s why we are spending this entire school year exploring the subject of racial and ethnic reconciliation.